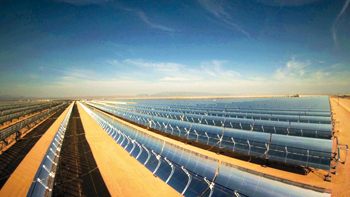 The UAE’s solar powered energy pricing has now reached parity with fossil fuel models, making it economically attractive and commercially viable for the first time ever in the nation’s history, argued a recent ‘REmap 2030’ report published by the International Renewable Energy Agency (Irena), in conjunction with Masdar Institute and the UAE Ministry of Foreign Affairs’ Directorate of Energy and Climate Change. Solar is the critical resource and focus for the UAE, with different forms of solar energy accounting for more than 90 per cent of renewable energy use in the Irena ‘REmap 2030’ report. But the Irena report says that the most important enabling factor for renewable energy in the UAE will be the empowerment of government agencies to take holistic, comparative views of en­ergy costs and act on them. Solar power, together with other renewable energy sources, could save the country billions of dirhams annually while introducing innumerable health and environmental benefits, while also acting to preserve precious existing fossil fuel resources. Solar photovoltaic (PV) module prices, as perhaps the best example of renewables’ new affordability vis-à-vis fossil fuels, have fallen by close to 75 per cent since 2008. “We believe that, for the UAE and wider Arabian Gulf, solar power is perhaps the most promising of all renewable energy sources – creating jobs while preserving existing energy reserves – and that is why we have created a dedicated exhibition zone in which this ever-popular renewable energy technology can be showcased. The event has always attracted the world’s biggest names in the solar sector, and, now, we are clustering them together in one area,” says Naji El Haddad, Group Event Director of the annual World Future Energy Summit hosted by Masdar and part of Abu Dhabi Sustainability Week. In 2015, there were 154 exhibiting companies from the solar sector occupying a gross space of 7,200 square metres, with more than 6,500 solar industry professionals in attendance, many of them from across the region where the uptake of solar energy is on the rise. Egypt, as one example, recently announced that the country plans to generate 18,000 MW of solar power over the next five years. In fact, the 2016 running of the event will see the launch of ‘WFES Solar Expo’, a dedicated area on the show floor for showcasing solar technology and innovation, and bringing together experts, innovators, suppliers, and buyers. More than 150 exhibitors have already confirmed their participation, with such global names as First Solar and Hanergy committed to take part in the exhibition and discussion proceedings. “The potential of solar power to quickly transform the energy sector in a lasting way should not be underestimated. And the related technologies and solutions from around the world are progressing so quickly that the industry is calling out for a single place at which to meet and advance solar power issues. Naturally, that place is Abu Dhabi” adds El Haddad.